So if you were a fan of How I Met Your Mother (HIMYM), and a little obsessive-compulsive, then you will have seen it through its awful last season, to its final, limping, end. After which you may have participated in the online post-mortem, where there was much rending of garments, wailing, and gnashing of teeth over what the finale meant. Most commentary focused on the gimmicky resolution to the long-running show, which seemed to undermine or contradict the development of the characters—there was a rushed, poorly-thought-out quality to the episode that (surprise, for a finale) left most viewers unsatisfied. I found the finale of a piece with the whole of the last season: once the writers were committed to making that last season a kind of miniseries, they’d pretty much sealed all the characters in amber, stuck for months of viewing time in one last, drawn-out, weekend with the gang, after which everything would change forever—FOREVER. With the endpoint looming over everything, the writers had no choice but to favor, or languish in, schmaltzy sentimentality and recycled gags, rather than fresher material that would add depth to the characters (not to mention require the actors to work a little harder). By contrast, I found myself just getting increasingly irritated by the show. I was supposed to be one of these viewers in the target audience, walking the same path from unfocused, rootless, single life to focused professional and personal life. When I started watching the show, while some characters were happily coupled, or happily single, Ted and Robin were the protagonists I related to; I shared in their hopeful quest to meet someone, to find love, to define their adult identities—and the appeal of the show, the energy which drove plot, tension, and humour, came from the ebb and flow of their successes and failures. I could relate to Lilly and Marshall retroactively and nostalgically—but it was the plight of Ted and Robin that made me feel some kind of included, commiserated, solidarity. They were muddling along a bit, but we were optimistic that everything would eventually work out all right for them (and hence for those of us identifying with them). After all, we know from the start that Ted must end up in some happy resolution, and assume (since it’s a sitcom, and not Scandal or Game of Thrones) that all the characters are moving towards a similarly-satisfying denouement. Except, as better quality stories have always reminded us—we know nothing, and peg our fortunes to the trajectory of our fictional protagonists at our peril. In the last couple of years, I began to feel increasingly that Robin and I were being jerked around as the story line of the Strong Independent Woman (SIW) started to split away from the ideal resolution promised by the main plot. The happy vision of romance leading to peaceful domestic comfort was proving to be a fairly rigid one, demanding certain qualities for the would-be heroines that they just couldn’t—sometimes, weren’t allowed to—provide. First, there was the problem of Robin’s self-sufficiency. After one particularly bad breakup, she’s devastated, and tearfully asks Ted what’s wrong with her, why can’t she meet a man who won’t let her down, who will stick with her, and whom she can trust and love? And Ted suggests that she’s too good at being herself—so competent and capable that most men, unable to do anything for her, can’t relate to her at all. (As when one’s mother says, “they’re just intimidated by you”—it’s an immense compliment, and yet of absolutely no comfort, because if the obstacle to happiness is what makes you you—then you’re quite stuck, aren’t you?) Ted means his explanation to be (back-handed) praise, because of course, both Ted and Barney admire, and yearn for her, because, or in spite, of her unshakable competence. Then, after being sure her whole adult life that she doesn’t want children, Robin meets a man who makes her doubt that misguided belief (if a woman says she doesn’t feel a need for children, she just hasn’t met the right man yet, right? ), and starts to panic a bit about her fertility. Rightly so, as it turns out she’s biologically excused from the potential of making a bad decision not to have children, by being unable to have them anyway. The SIW is going to stay that way, whether she likes it or not—and she loses the man as a result. By implication, we know at that point that she’s no longer a candidate for the Mother, because as much as Ted loves her, he longs for children—and the structure of the show, as one giant, extended flashback, has made it clear that he will have them. Somehow, partly because of her own choices, partly because of the manipulation of the plot, and partly because of the role she occupies socially, she can be cool Aunt Robin, but domesticity—tied directly to her fertility—is off the table. But that’s ok, because Barney loves her anyway! Of all the characters in the ensemble, Barney is so patently a caricature, a campy cut-out of the selfish, childish, often-misogynistic “bro” that he can’t be taken seriously, even when he throws away the Playbook to signal his dedication to Robin—and yet, he’s the one who seems to be the best match for her. Importantly, he appreciates that she is more of a bro than Ted, with her focus, ambition, and preference for scotch. And unlike Ted, Barney doesn’t need her to give him children, he loves her just the way she is. Until he doesn’t. After a huge, improbable, build-up, Robin’s and Barney’s marriage fails. What he liked about her was exactly her independence, self-sufficiency, and “masculine” self-sufficiency—and when she stays true to those qualities, he becomes peevish and resentful. Apparently, Robin might be excused from maternity as long as she takes on the parenting of her husband—something which, because she’s the SIW, she can’t and won’t. Once divorced, Robin drops from the scene entirely, without much explicit reason (because, keep in mind, the writers are tying up loose ends in literal seconds in the last moments of the finale); the focus shifts entirely to the other four (and you realize it’s been shifting that way all season). Lilly and Marshall have it all—he’s a judge, they have their second child—they remain, as they have been throughout most of the series, Tolstoy’s uninterestingly happy family. Ted and Barney share the foreground—married, in Ted’s case, and happily reproductive in the case of both. Ted’s impossibly-saintly and wise wife bears him two children before conveniently dying of an unspecified illness (I don’t mean to be callous, but that’s about as much detail or sympathy as the show accorded her in the 10 seconds allotted to that plot point); Barney’s #31 of a month’s worth of hook-ups ends up pregnant, and though we never see her, and she’s given no other identity beyond #31, the resulting daughter is what finally breaks Barney of his selfish and misogynistic treatment of women (arguably, his ideas are just as simplistic as ever, though they’ve just manifested by sentimental, paternalistic idealization of all women as someone’s precious daughter). While all this is happening, from the characters’ late 30s to their late 40s, Robin fades into the background. Lilly and Marshall describe sightings of her as rare, and when they occur, Robin is touchy and sullen—prompting the comparison of her to a rare and secretive mythical creature—not a unicorn, more like a Yeti. In montage, we see that in fact, Robin is off doing all sorts of Impressive Things—she becomes a Canadian-American Christian Amanpour, providing important exposés and coverage of world events. But Robin is cut loose from the others, who all get to have children, and get to stay together as friends, while, as the SIW, she is off in some undefined unexamined social wilderness, made figuratively monstrous by her singleness and childlessness. It’s only once Ted’s kids are safely into adolescence, and the fecund goddess-mother is killed off, that Robin returns—because Ted realizes that she’s the one he’s loved and desired all along. Of course, when he shows up to woo her with the blue french horn she is available, amenable, and grateful? relieved? And they all live happily ever after (except for the expendable Mother, and #31). Hmm. Do you think I’m reading too much into all of this? I guess I’m not supposed to pay that much attention to Robin’s situation, nor take it so personally, because, presumably, I’m supposed to have ceased relating to her character at some point in the past—viewers like me, maturing with the characters, are supposed to have had a similar trajectory in their lives, from lost singleness into domesticity, and the community formed by family units. Except, like Robin, there are those of us for whom that trajectory just doesn’t work out that way—and we don’t appreciate the suggestion that our path inevitably leads us to the periphery, to become supporting characters who can provide useful plot development, but who are not otherwise central to the narrative. I know it’s just a silly sitcom that jumped its shark a long time ago, and the finale was a narrative hash for all kinds of reasons. I also know that I mustn’t take pop culture so seriously—it’s really bad form to, you know, think critically and point out undercurrents of patriarchal and heteronormative bias that pervade popular culture and nudge us all to make similar choices about careers and relationships (oops, do excuse me, my ideological slip is showing…). But those undercurrents are there! * Despite all sorts of overly-enthusiastic lists of “why it’s great to be single”—we SIWs are under a lot of pressure not to be—because if we don’t overcome our singleness, where will we fit? No children, no partnership—to whom are we connected? 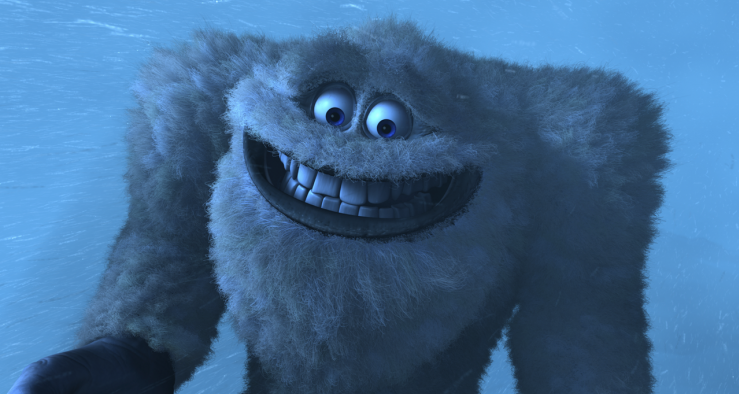 HIMYM’s facile, sexist, answer, apparently, is that the SIW/Yeti is connected to no-one. She exists, but in the parallel dimension frequented by fairies, ghosts, abominable snowmen, and other cryptids—no-where where nice, respectable middle-class folk would ever go. Except such an answer is nonsense, and completely undervalues the potential for a rich, generous, connected existence, which is the actual experience of most of the SIW’s I know, myself included. Being single may be a temporary or a permanent state, but either way, being single means neither that we are unsuited for, nor uninterested in, nor excluded from, any kind of “normal” or happy life—we just learn to define those terms in a much broader (I think, more interesting) way. The HIMYM finale was an aggravating failure of narrative, social, and political imagination. The finale I would have liked to have seen would have been the set-up for a spin-off series about Robin’s life: her grief and dismay when her fairy-tale (?) marriage falls apart, and, instead of enjoying the security and certainty (the restfulness) of being a wife, she finds herself single again; her bewilderment at her married friends, who have turned inwards towards their children and one another, and who seem to have no time for the outside world at all, let alone her; her resolution to just get on with it anyway—to achieve, create, and change through her work, to travel, explore, live; her delight at her ability to build an amazing family for herself on her own terms (parents, siblings, friends). Maybe she finds a new love-interest; he might have kids of his own from a previous relationship—which is cool with her because she likes being Cool Aunt Robin—or he might not; he will definitely and conveniently have a flat (a loft) in London and know lots of interesting people there (because he will, apparently, be the hot English photographer from House of Cards), which will be a nice contrast to her cozy retreat in the south of France. She will occasionally be very unhappy; she will often be overcome with gratitude and amazement at how happy and full her life has turned out to be. She will absolutely not spend a single moment languishing in some culturally-imposed fallow, cryptozoological purgatory of spinsterhood; if anyone, even her best friends, ever uses the word Yeti (or similar) in her presence, she will throw her whiskey cocktail in their face—then laugh about it afterwards while she watches Hot English Photographer make her a steak; and if that ridiculous Ted Mosby (trying to repress his own grief at the loss of his very lovely wife by reverting to a simpler, idealized romantic opportunity that he lost a long time ago) shows up outside her window expecting her to drop her knitting and rush into his arms—he won’t find her there, because she will be out living her life. That’s the finale I would like to see. *The Madonna/Whore representations of the Mother and #31, not to mention all of Barney’s “conquests” over the years was pretty consistently insulting too, especially since the viewing public seems to accept and endorse those roles with no critical examination at all….